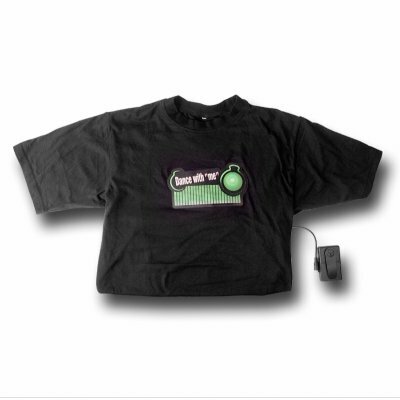 Successfully Added Sound Activated EL T-Shirt - Medium to your Shopping Cart. T-Shirt with a sound activated EL (electro luminance) design sewed onto it, available in medium. This is a perfect clothing accessory for any person who loves to go to the club, and wants to stand out from everyone else on the floor. Every time the music beats, the T-Shirts EQ bars will beat up and down with the music. The softer the music, the lower the bars, and the louder the music, the higher they go. Finally, with the attached sound sensor, you can adjust how sensitive the sound receiving is. A great clubbing item, at a fraction of the price you would expect from such a cool gadget. If you wish to make comments or reviews about this product, please use the product review. Please open a enquiry enquiry ticket if you have questions.